Full disclosure, this was a family affair. My dad and uncle started Seal-It Asphalt Sealcoating in 2015. 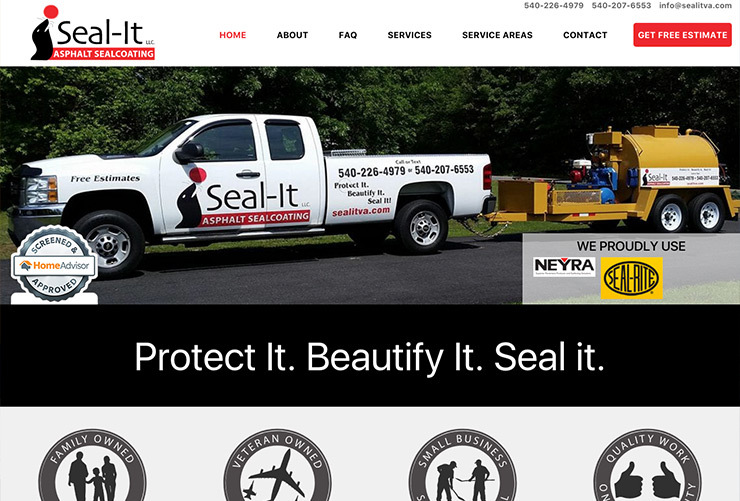 Seal-It provides asphalt sealing and minor repair services to residential driveways and commercial parking lots. I started with the logo. The seal with ball graphic was designed by my cousin, but I took that portion and incorporated into the full logo. I then designed and developed the website. The current site is the second iteration of the site, which uses screen real estate more efficiently that many of the other projects I’ve worked on. I think this is the first site where I incorporated some flexbox techniques, especially for the menu where items use space more efficiently than other methods I’ve commonly used.